Cucusoft? avi to DVD Converter. How to convert DivX,XviD,AVI to DVD? Solution A, (recommend) Create DVD with "Cucusoft MPEG/AVI to DVD/VCD/SVCD converter Pro", just one software. Solution B, Create DVD with "Convert MPEG/AVI to DVD/VCD/SVCD Converter Lite" + Nero. Convert video files(avi/mpeg/Divx...) to DVD with Cucusoft MPEG/AVI to DVD converter. Launch Cucusoft AVI to DVD/VCD/SVCD Converter pro, you will see the right UI. 1. Select radio button "To DVD"
2.choose the "merge" or "batch" tab. 4. (optional) Set your preference. Region "4" in red frames can set the output MPEG properties. 5. (Optional) Set the advanced settings as following. 8. 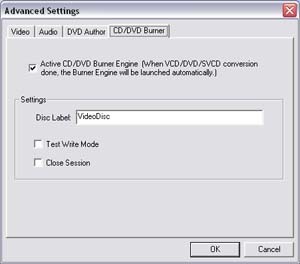 After video conversion done, the "CD/DVD Burning engine" will be launched automatically. Please choose the DVD burner. 9. Please place a DVD-/+R/RW disc into your DVD burner. If it is a rewritable disc, the program will erase the disc before burning DVD disc. 10,When burning DVD is done, the DVD disc will be eject automatically. You can also find the output file at the output folder. Convert video files(avi/Divx/Wmv...) to DVD with Cucusoft MPEG/AVI to DVD converter. Launch Cucusoft AVI to VCD/DVD/SVCD Converter Lite, you will see the right UI. 5. (Optional) Set the advanced settings as following. 7. After finish, the conversion dialog will be closed automatically. You will get the folder named "DVD_Disk1" under your output folder. Tools required: Nero 5.5 or later, get the demo here. 4. In "File Browser" window, open your "DVD_Disk1" folder ,open the folder" VIDEO_TS" and select all the files in it. 6. Select File->Write CD or click "Open the write cd dialog..." button at "6". After you click "Write CD", you will see the UI below. 6. Mark the check box of "Write". 7. Select Write speed, lower may work better if you get problem on playing the DVD.